At the Wednesday, Nov. 28 holiday open house at the newly redesigned flea market are, from left, Caesar Creek Flea Market General Manager Mary Burr, Al Bell who is president and CEO of parent company Levin Service Co., and Caesar Creek Flea Market Operations Manager Taylor Clark. 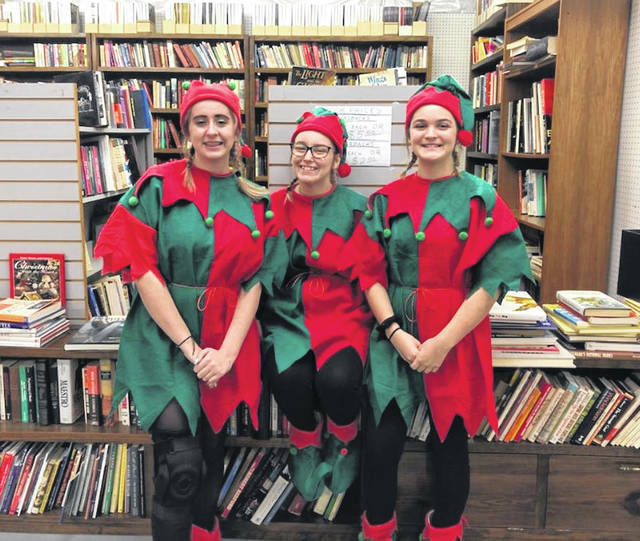 Elves will help you get in the holiday spirit starting this weekend at Caesar Creek Flea Market. 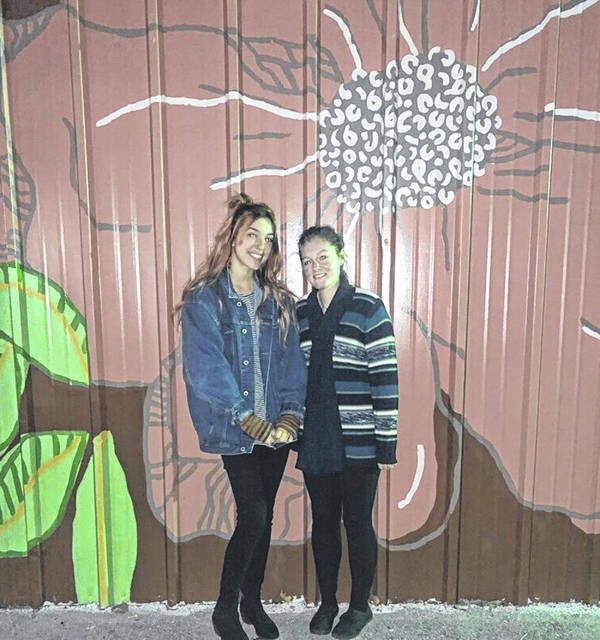 Shown are Caesar Creek Flea Market Advertising and Marketing staffers Lindsay Welton and Ashley Little, who along with Tori Austin created all the artwork on the outside and inside on the aisles. CHESTER TOWNSHIP — A “Winter Wonderland” will be an ongoing attraction at the Caesar Creek Flea Market starting Saturday, Dec. 1. Winter Wonderland is a decorated space that includes an area set up for children. There they can write letters to Santa and decorate cookies. Through the weekend of Dec. 22-23, costumed elves will be walking throughout the flea market. And as part of the Winter Wonderland attraction, two very special guests will visit the flea market from 11 a.m. to 2 p.m. on Sunday, Dec. 16. As reported earlier, two live reindeer from White Tails Farms will be in the Winter Wonderland area just west of Building 7 for shoppers to pet, take photos, and learn about. Elves will be joining the reindeer to help children with holiday-themed activities, and serving holiday treats, hot chocolate and hot cider. Santa is expected to be there with the reindeer. A focus on holding engaging events is part of Caesar Creek Flea Market’s efforts to build a community attraction, stated a media release. 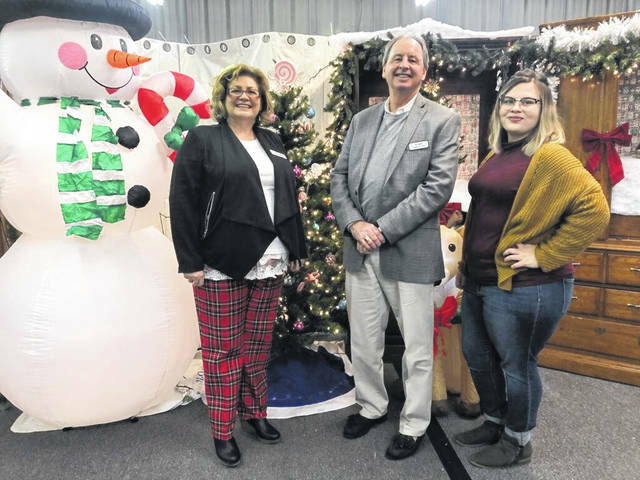 On Wednesday, Nov. 28, Caesar Creek Flea Market hosted a Wilmington-Clinton County Chamber of Commerce holiday open house. Attendees enjoyed delicious small bites, festive beverages and Christmas goodies while exploring the Homestead Charm, Discount Dock, and Your Community Store at the newly redesigned flea market. With more than 100 vendors, Caesar Creek Flea Market near Wilmington offers live music, food, home decor, and a variety of unique items throughout the year on Saturdays and Sundays from 9 a.m. to 5 p.m. It opened 40 years ago in 1978. For more information, please visit caesarcreek.com .